Remember this stack I was frantically cutting before vacation (instead of packing) ? 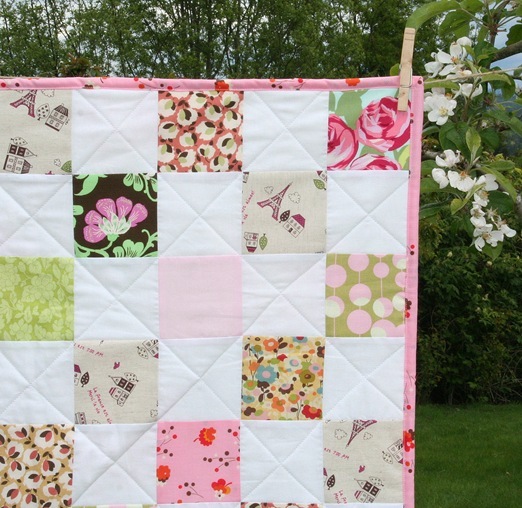 Now its this crisp baby quilt with the cutest little Paris print in it. The linen fabric is so nice to work with, plus it matched about every other girlish print I own. I bought the Nicey Jane back for this one at the same time I bought the polka dot I used on the boy quilt. It took me a long time to find this fabric in stock! I don't know how you find the time to sew with a new baby. I only have one and he is 9 months old and seems impossible to find the time. You are my inspiration. Love the quilt. Love. Love love love. Happiness. This is such a beautiful quilt!! Nicely done! I love it! The colors and theme are perfect. I especially love the back of the quilt! beautiful job!! 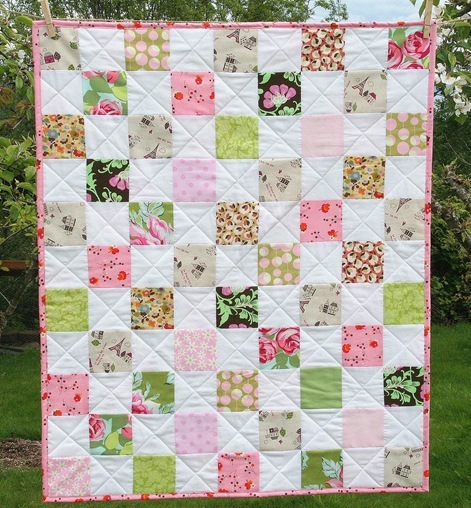 I love the diagonal quilting. Great colors. That Parisian print is awesome. Very cute quilt. love it! beautiful and crisp. Oh oui c`èst chic, especially the backing fabric! Wow Allison :) so sweet… Love that backing print. Nicey Jane has just arrived (I know!) at my LQS here in NZ – but get this, the price per metre is NZ27 – which is about US$20 for 39". I will howevery buy a little bit. And a big bit for a quilt backing. It's such a sweet line. However. I meant however. LOL – it's going to be a long day. Looks great! So very sweet! It reminds me of Amelie… Beautiful and feminine! 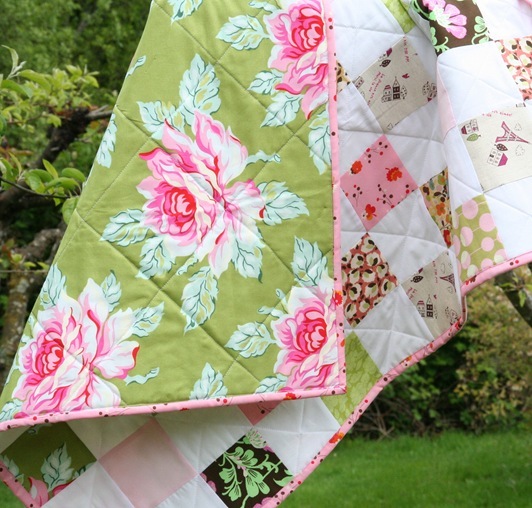 I LOVE the quilting on that- so simple, but stunning! It really showcases the fabrics! Darling! The backing is to die for. The backing and the clean, crisp quilting make it! Good job. How much fabric do you buy for backings at a time, generally? gorgeous! I love how beautiful a simple nine patch is when you use fabulous fabrics! Beautiful! The backing fabric is lovely. Where did you find that Paris print? I bought a fat quarter of that at the International Quilt Festival in Chgo from a vendor from NJ. I should've bought more! Gorgeous and what a stunning background too.